Hi all. We will no longer be posting at livingdonorlove.com once we get the call that they have a kidney for Gary – God willing. We have created a Caring Bridge website for Gary’s kidney transplant journey. If you wish to stay in touch, please click on the link below. Madison called today. They gave Gary the green light. They have agreed to put him on the active deceased donor list. There are a few administrative issues that need to be taken care of. They will call Gary next week to confirm those few details and at that time they will actually place him on the list. Oh My. Grateful and terrified all at the same time. Saga continues….Madison, WI called us again today. They are so nice, by the way. They are reviewing Gary’s case again this Friday. They told us that there are two medical issues that they need to explore further before making a decision. We are guessing that when they call us back either this Friday or next Monday they will either say: 1. Yes, we will put you on the active list 2. No, we will not put you on the active list 3. We need you to take some additional tests before we render a decision. All I can say is Oy Vey!!!! P.S. Never heard from Northwestern Hospital today as they promised. Gary will call them tomorrow to find out what is up. Ok, University of Wisconsin called us this morning. No answer. They need Gary to send a CD of one more test result. They told us we would have an answer no later than this Friday. Waiting for THE call. Then waiting for THE answer. I do believe that many have been through this trying process. Therefore, I am sure you can appreciate the toll this can take on a person, a family. Still the focus must remain on love, gratitude and purpose. Consciously choosing to not lose this time while we wait. It is a gorgeous sunny day outside. Let’s go enjoy the day and make a difference. Love. Everyone has these “moment of truth” moments in their lives. A time when their is a cross road where life altering decisions get made. Well, one of our “moment of truth” moments is upon us. This coming Monday, the University of Wisconsin kidney transplant team will be calling us to let us know if they will put Gary on the active deceased donor list. Northwestern Hospital will be calling us on Wednesday to let us know the outcome of Gary’ kidney re-evaluation – are more tests needed, will they put Gary on their active deceased donor list, etc. What is the key life lesson here? Carpe diem, baby! Just heard from Madison, WI. They have not reviewed Gary’s case yet. They will be doing so tomorrow. They told us they would give us a call either Friday afternoon or Monday morning to tell us whether or not they feel Gary is a viable candidate for the active deceased donor list. We look forward to answers one way or the other so we can get on with our life. Still have a lot of living to do!! Amen. Grateful. There has still been no word from the Madison, WI transplant team. Soooo, Thursday night we head downtown to stay the night near Northwestern Hospital. Gary will be going through the Northwestern Hospital kidney transplant re-evaluation again. An all day event. This transplant team is only available to Gary if we find a living donor in short order. It is a long shot but like Gary’s primary care doc advised us, keep all your options open for as long as you can. If you are one of the six living donors who stepped up five years ago to help Gary and are still willing to do so, or if you know who any of those people are or you are a new willing living kidney donor, please contact Northwestern Hospital transplant team and let them know you are willing to donate your kidney to Gary. Thank you. So I have been told….Patience is not simply the ability to wait – it’s how we behave while we’re waiting. No calls back. Just waiting. In the meantime filling the days with love, gratitude and purpose. As we get closer to receiving “the” call tomorrow from Milwaukee and Madison transplant teams, one’s thoughts start to wander to the seriousness of the path we may be taking. 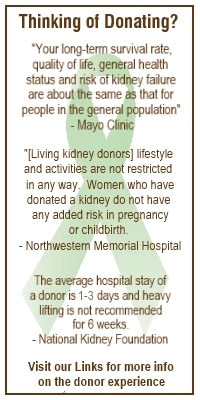 There is no magic bullet for a person who has no functioning kidneys. All remedies are loaded with risks, side effects, life style implications. Thoughts are moving from jubilation at the prospect of being given a choice to fear and apprehension from all the “what ifs” surrounding very risky and complicated organ transplant surgery. Let’s see…Let Go Let God…..Keep the Faith…..What Will be Will be…..Fate….Destiny…. Turn it Over… How does one get comfortable with the daunting prospects that lie ahead? How about turning to the awe and wonder of life. Turning to the love and support that surrounds us from our beautiful family and friends, the wind beneath our wings. There may be no magic bullet to fix Gary but there is the Magic of Love. Yesterday we spent yet another day being re-evaluated at yet another kidney transplant center. Although now, it is different. There is urgency in the mix. Yes, when Gary turns 80, in 9 months a kidney transplant is off the table. Sitting with the Froedtert Hospital kidney transplant team members it felt very different. It is no longer a theoretical conversation. Now we are asking for another human being who has lost their life to give Gary one of his or her organs to then put in Gary’s body to help him live longer and have a better quality of life. Oh My. Years back this would have sounded like material for a science fiction movie. The medical community has come so far. What a miracle. I/We are in awe. We do not take this lightly. We feel there is a very good chance Milwaukee will pass on Gary. For many reasons, I would guess, but we are speculating that his age and the wait list at their place is just not a good fit. Their wait list is 6-8 years. Gary would be ineligible by the time a kidney would probably be available at their center. We could be wrong but don’t think so. They will call us this Friday, March 29, with their answer. Are we grateful to science and all the people who came before us, those who have lost their lives and those who have gained life as a result, yes. Grateful to the moon and back. Filled with love and appreciation for the gift of life.